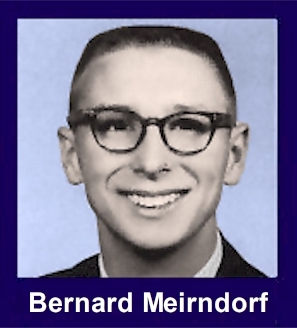 The 35th Infantry Regiment Association salutes our fallen brother, PFC Bernard James Meirndorf, who died in the service of his country on October 9th, 1967 in Quang Tin Province, Vietnam. The cause of death was listed as Small Arms/AW. At the time of his death Bernard was 20 years of age. He was from Williamston, Michigan. Bernard is honored on the Vietnam Veterans Memorial at Panel 27E, Line 82. The decorations earned by PFC Bernard James Meirndorf include: the Combat Infantryman Badge, the Bronze Star with V, the Purple Heart, the National Defense Service Medal, the Vietnam Service Medal, the Vietnam Campaign Medal and the Vietnam Cross of Gallantry with Palm Unit Citation. Bernard was a carpenter in civilian life. Bernard was a member of the Class of 1965, Perry High School, Perry, Michigan. BERNIE WAS THE TYPE OF PERSON THAT WOULD HELP ANYONE. HE GOT ALONG WITH EVERYONE. HE WAS A GOOD STUDENT AND A GREAT FRIEND. WE MISS HIM. For heroism in connection with military operations against an armed hostile force in the Republic of Vietnam. On 9 October 1967, Private First Class Meirndorf distinguished himself while serving as a Rifleman in A,1/35th Infantry engaged in a search and destroy operation near Phuoc Son. Private First Class Meirndorf's platoon was advancing up the side of a mountain through thick underbrush when it was taken under automatic weapons fire from a reinforced NVA company. The platoon's movement was halted, and one of the men in Private First Class Meirndorf's squad was wounded. Risking his life in the intense hostile fire, he ran to the side of his wounded comrade and began to administer first aid. He then attempted to pull the injured man to a safer position, but he was mortally wounded before he could reach cover. By exposing himself, he had caused the enemy to concentrate their fire on him, allowing the rest of his platoon to maneuver into positions from which they could better engage the enemy. Private First Class Meirndorf's heroic actions are in keeping with the highest traditions of the military service and reflect great credit on himself, his unit, and the United States Army.